Successful traders ensure that they are aware of the events around the globe on a real-time basis. It is vital to read the news and be updated on what’s happening around the world. Full-time traders who trade online know that their profession is highly competitive and risky. The returns earned by them can be astounding. 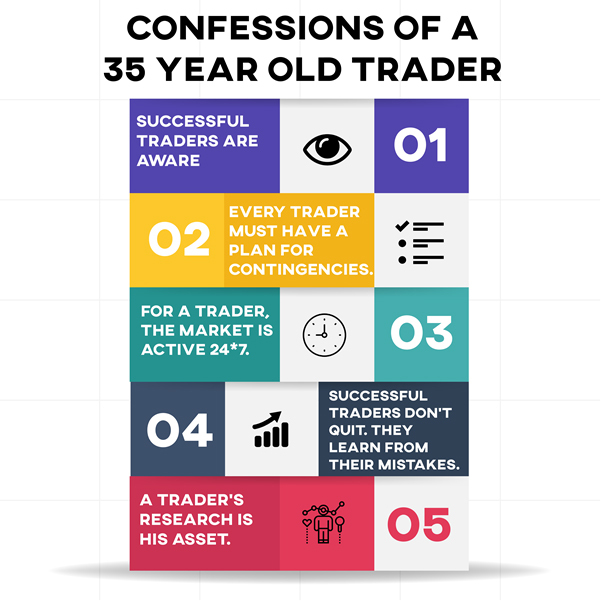 Today we reveal the confessions of successful traders in their mid-30s who have more than a decade of experience in online stock trading. Every trader has a meticulous routine when it comes to watching or reading the morning news. Successful traders ensure that they are aware of the events around the globe on a real-time basis. It is vital to read the news and be updated on what’s happening around the world. No trader would like to be blindsided by an unexpected turn of events. It can make all the difference while predicting a new trade! All traders have plans for the day, week and month. Simultaneously, they also have contingency plans so that they can minimize their losses in case of unforeseen circumstances. In fact, every trader knows in his heart that even when the things are going his way, there will be some factor which may throw all his plans for a toss! It is a risk that each trader has accepted. They plan their trades based on their risk-bearing capacities. For a trader, the market is active 24*7. It is very addictive, and traders tend to get hooked onto online trading. Many times work-life balance goes for a toss! They rationalize that in today’s digital urban workspace, this is the norm for nearly all professions and they believe that they can work hard when they are young to retire wealthy & early. For many, the age for retirement never comes. Every trader has made a few trades in his life which he dearly regrets. They pretend that they are calm, composed and indifferent to lost opportunities. However, the fact that they lost an opportunity or that they did not quit when they were ahead in the game haunts them. The successful ones manage to learn from such mistakes and ensure that they avoid the same in the future. Traders are highly protective of the information they possess and strategies that they employ. Under no circumstance will they part with any of the research or analysis that they have conducted. If they do appear to impart some facts or predictions nonchalantly, the layman has the option to follow the stock market tips at his own risk blindly or to ignore it. Asking the trader on how he came across the same would only produce some vague answers. Most of the traders have had the temptation and the opportunity to indulge in insider trading at least once in his life. It is then a matter of personal ethics and morals whether or not they indulged in it or not. Last but not the least, every trader tends to lament publicly on his losses and to celebrate all his profits privately. Every trader experiences these ups and downs during years of his career.